A large event has been planned on May 4, 2019 to celebrate “ Growing Green with Pride .” This event is part of the County Executive’s Beautification Initiative. 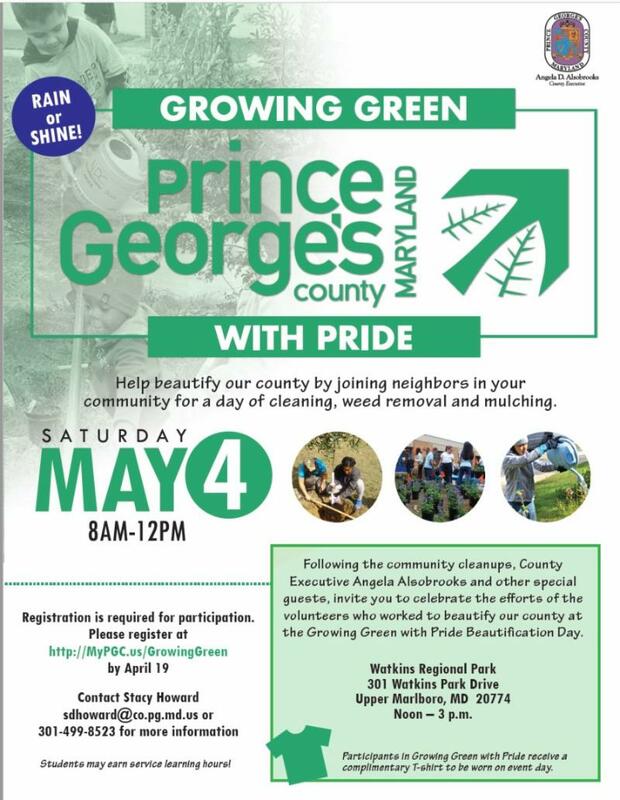 From 8am until 12 Noon, volunteers throughout Prince George’s County will help beautify their communities by removing weeds, mulching and cleaning. Our County Executive Angela Alsobrooks will be volunteering in different communities throughout the County. The culminating event will be a picnic at Watkins Regional Park beginning at 12 Noon until 3pm. An organization may seek additional information and register online at the following website link: https://www.princegeorgescountymd.gov/2590/Growing-Green-With-Pride . T hey may also download a registration form atRegistration-Form-for-Growing-Green-With-Pride-Event_2019 . If they have any additional questions, please refer them to the staff representative of Department of Public Works and Transportation, Stacy Howard at sdhoward@co.pg.md.us or (301) 499-8523. Please contact President McNeill if you have any questions.